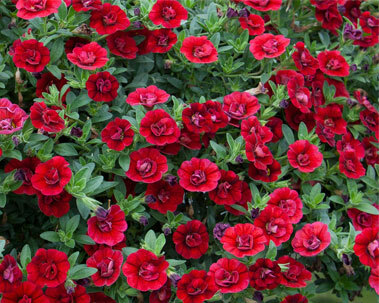 Gardening NewsHome » News & Posts » News & Posts » Mini Famous® Double Dark Red – New for 2014! Mini Famous® is a range of Calibrachoa plants with double flowers. Calibrachoas are trailing plants with mini petunia flowers. The Mini Famous® range produces masses of fully double flowers that are about the size of a ten pence piece. They look amazing in hanging baskets are they produce a neat ball of colour. 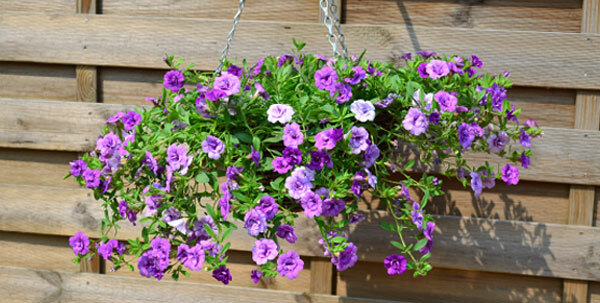 The picture below shows a hanging basket which we planted with Mini Famous® Double Amethyst plug plants last year. We think you’ll agree it looks lovely! We would recommend planting 5 Mini Famous® plug plants to fill a 12″ or 30cm hanging basket. You can read our step by step guide to planting a hanging basket here. This year Double Dark Red has been added to the Mini Famous® range. For more information on growing Mini Famous® plug plants, have a read of our guide. previous post: Verbena Lanai™ Blue Twister – New for 2014! next post: 10 Brand New Varieties for 2016! Home » News & Posts » News & Posts » Mini Famous® Double Dark Red – New for 2014!